The word scale is generally used for an instrument used for drawing straight lines. But actually in Geographer’s language scale means the proportion or ratio between the dimensions adopted for the map and the corresponding dimensions on the ground. It can be indicated in two different ways. Example: The actual dimensions of the room say 10m x 8m cannot be adopted on the drawing. In suitable proportion the dimensions should be reduced in order to adopt conveniently on the drawing sheet. If the room is represented by a rectangle of 10cm x 8cm size on the drawing sheet that means the actual size is reduced by 100 times. b) Representative Fraction: – (RF) 1/100 is the ratio between the size of the drawing and the object. When an unusual proportion is to be adopted and when the ready made scales are not available then the required scale is to be constructed on the drawing sheet itself. To construct the scale the data required is 1) the R.F of the scale 2) The units which it has to represent i.e. millimetres or centimetres or metres or kilometres in M.K.S or inches or feet or yards or miles in F.P.S) The maximum length which it should measure. If the maximum length is not given, some suitable length can be assumed. R.F X maximum length the scale should measure. This should be generally of 15 to 20 cms length. The various types of scales used in practice are 1. Plain or Simple scales, 2. Diagonal scales, 3. Vernier scales, 4. Comparative scales and 5. Scale of chords. Simple or Plain Scales: They read or measure upto two units or a unit and its sub-division, for example centimetres (cm) and millimetres (mm). When measurements are required upto first decimal, for example 2.3 m or 4.6 cm etc. It consists of a line divided into number of equal main parts and the first main part is sub-divided into smaller parts. Mark zero (O) at the end of the first main part. From zero mark numbers to the main parts or units towards right and give numbers to the sub-divisions or smaller parts towards left. Give the names of the units and sub-units below clearly. Indicate below the name of the scale and its R.F clearly. The construction of the plain scale is explained below by a worked example. A 3 cm long line represents a length of 4.5 metres. Extend this line to measure upto 30 metres and show on it units of metre and 5 metre. Show the length of 22 metres on this line. i) The scale has to represent metre and 5 metres, hence it is a Simple or Plain scale. Draw a straight line of 20cm length and divide into 6 equal parts. Divide again first part into 5 equal parts. Give numbers as shown. To represent 22 metres, take 4 main parts to represent 20 metres and 2 small parts to represent 2metres. Give names as A and B so that the distance between A and B is 22 metres as shown. Construct a Simple scale of 1:5 to show decimeters and centimeters and to read upto 1 metre. Show the length of 7.4 decimetres on it. i) The scale has to represent decimetre and 1/10 of decimeter. Draw a straight line of 20cm length and divide into 10 equal parts. Divide again first part into 10 equal parts. Give numbers as shown. To represent 7.4 decimetres, take 7 main parts to represent 7 decimetres and 4 small parts to represen0t 0.4 decimetres. 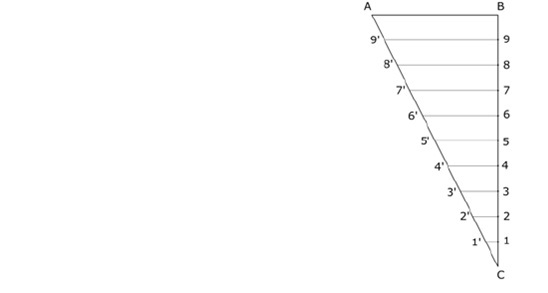 Give names as A and B so that the distance between A and B is 7.4 decimetres as shown. Diagonal scales are used to read or measure upto three units. gs and yards etc. This scale is used when very small distances such as 0.1 mm are to be accurately measured or when measurements are required upto second decimal. For example: 2.35dm or 4.68km etc. ii) At one end, say at B draw a line perpendicular to AB. iii) Mark 10 equal divisions by taking some convenient length starting from B and ending with C.
iv) Give numbers from 9, 8, 7—-1 as shown. v) Join C to A and from 9 to 1, draw parallels to AB, cutting AC at 9′, 8′, —— 1′ etc. An area of 144 sqcm on a map represents an area of 9 sqkm on the field. Find the R.F.of the scale for this map and draw a diagonal scale to show kilometers, hectametres and decameters and to measure upto 5 kilometres. Indicate on the scale a distance of 3 kilometres, 5 hectametres and 6 decametres or 3.56km. The area on the map is 144 sqcm and the area on the field is 9 sqkm. Draw a line AB of 20 cm and construct a rectangle on it, by taking AD 5cm as shown. Divide AB into 5 equal parts and number them from second part starting with 0 to 4 towards right side to indicate kilometers (km). Divide 0A into 10 equal parts, each part represents a hectametre (hm). Divide AD into 10 equal parts, each part represents one decametre (dam). Join diagonals as shown. To mark 3.56km, take it as sum of 3.50km and 0.06km. On the plain scale take 3.5km and on the diagonal at 5 upto 6 parts diagonally which is equal to 0.06km, giving a total of 3.56km as shown by MN. This entry was posted in Geography Practicals/Lab and Statistical Techniques, map making, Statistical Techniques. Bookmark the permalink. How we can divide the line segment of 7.6 inches in 4 equal parts?